As we have been away for a few days, here is another brief post to provide news of various matters. Official first day covers distributed by Royal Mail were all believed to have stamps printed by De La Rue all coded MA13. 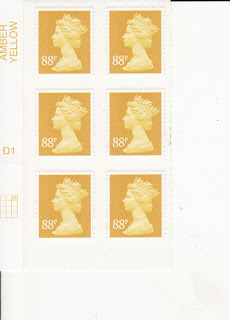 However, we understand that some have the De La Rue Signed For stamps, but 78p, 88p and £1.88 stamps by Walsall coded M13L. These may have been covers made up manually to be used as replacements for any which had been damaged in transit to standing order customers. The 88p DLR sheet-printed stamps have now appeared on eBay. We hope to have these in stock soon. 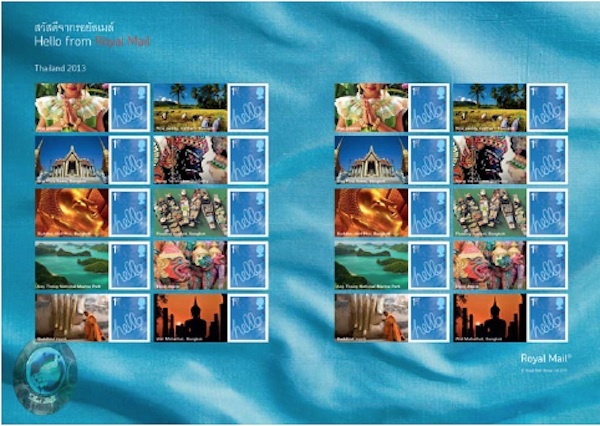 The Fédération Internationale de Philatélie (FIP) nominated Thailand as the country to host the World Stamp Exhibition in 2013, which will be held in Bangkok from 2nd to 14th August 2013, and will commemorate the 130th anniversary of Thai postage stamps and the establishment of the Thai postal service. Royal Mail will issue the usual style of exhibition sheet, printed by Cartor Security Print and containing 20 x 1st class Hello stamps and 10 different pictorial labels. Having just got the may stock list, I see the Walsall/De la Rue definitives are not regarded as different with the stamps each having one code, yet the Cartor printings of the country stamps have different codes from the De la Rue.